Preheat oven to 350 degrees F. Line a 9-inch square baking dish with parchment paper. Melt the chocolate and butter together in a heat proof bowl set over a saucepan of simmering water, stirring often. When chocolate is melted and smooth, remove from heat and let cool for a few minutes. Add the sugar and vanilla extract and combine with a wooden spoon. Add the eggs one at a time, mixing after each. Add the salt and flour and stir until combined. Fold in the hazelnuts. Pour the batter into the prepared baking dish and use a spatula to spread it evenly. Drop the chocolate hazelnut spread by the tablespoon onto the brownie batter, about 1 inch apart. 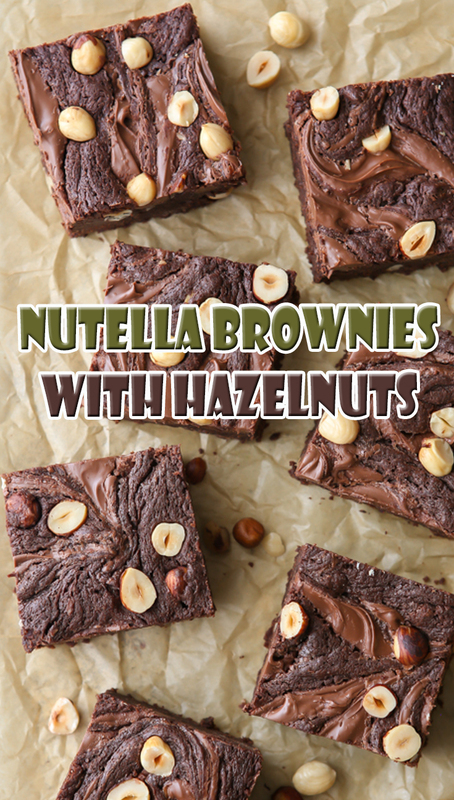 Use a toothpick or knife to swirl the chocolate hazelnut spread into the brownie batter. Do not completely combine them, you want visible swirls of the spread in the batter. Bake for 25 to 30 minutes, or until the edges appear crispy but a toothpick inserted into the center comes out with moist crumbs. Let the brownies cool to room temperature. For best results, chill completely before slicing and serving. Store the brownies in an airtight container at room temperature for several days, in the fridge for 1 week, or tightly wrapped in the freezer for a few months.